Since the 2007 season-opener in Australia, there has been much talk of 'movable' floors on Formula One cars. Teams are developing a way to mount the floor in such a way that it will pass the standard deflection test during the scrutineering, but then lift under greater aerodynamic loads at speed on the circuit, providing significant aerodynamic gains. All teams were working on that, but only few have a guts to actually run it. Ride heights are crucial in terms of improving the aero performance of a Formula One car. For this reason, several years ago teams developed flexible floors that would bend under load, thus allowing the car to run much closer to the ground. The FIA decided to police the situation by introducing a floor deflection test. This test uses the normal scrutineering platform. A hydraulic ram pushes the floor upwards from beneath the car and the amount of movement under a specified load is measured. As with wings flexibility test, if the part passes this deflection test it is deemed legal, even if the part may flex further under a greater load. This apparent anomaly is present because the FIA decided to provide a certain degree of freedom in the regulation to avoid damage to this section of the floor when the car rides over kerbs - especially as in recent years most of the ballast placed on the car is located in this area. Article 3.17.4 of Formula One racing's current technical regulations states that no bodywork part, floor included, can deflect more than 5mm vertically when exposed to a 500 Newton upward load. 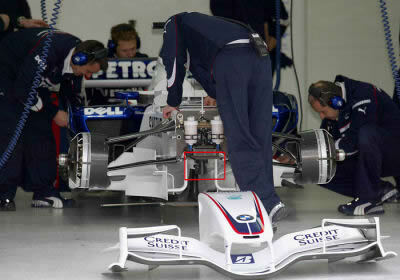 McLaren became aware of Ferrari's device, used by BMW Sauber as well, early in the Melbourne weekend. During this period of time Ferrari's chieff mechanic Nigel Stepney (later accused of spying Ferrari team and transferring a lot of technical and set-up information to McLaren), informed McLaren about this innovation. Subsequently, autosport.com has learned that McLaren's engineering director Paddy Lowe wrote a letter to the FIA in Australia, asking if his team could fit a similar system to their car. In his letter, which also contained a diagram of McLaren's plans, Lowe wrote: "We would like to consider the installation of a mechanism on the front of our floor, consisting of springs and pivots. "By a suitable arrangement and configuration of the springs (rates and preloads) within this mechanism, we will be able to control the flexibility of the bib so as to meet the requirements of the test specified in Article 3.17.4, but to otherwise allow greater flexibility at higher loads by a non-linear characteristic." Lowe's letter was clearly aimed to put FIA attention to this device used by Ferrari and BMW as main opponents, and clarifying whether or not the use of such a device was deemed legal if its sole intention was to get around the FIA's flexibility tests. A week later, FIA technical delegate Charlie Whiting responded to McLaren, and in a letter also distributed to every other team, he clarified the allowed usage of such a device - and revealed that bodywork testing would be altered accordingly. Whiting wrote: "The test described in Article 3.17.4 is intended to test the flexibility of bodywork in that area, not the resistance of a device fitted for the purpose of allowing the bodywork to move further once the maximum test load is exceeded. "Quite clearly, any such device would be designed to permit flexibility and is therefore strictly prohibited by Article 3.15 of the Technical Regulations. "We have no objection to a device in this area which is fitted to prevent the bodywork from moving downwards, provided it is clear that it is not designed to circumvent the test described in Article 3.17.4. "Therefore, with immediate effect, we will be testing bodywork in the relevant area with any such devices removed. What are a potential benefits? If you introduce a way to allow the car's floor to lift at high speed, it will lead to stall of underbody aerodynamics. But what does this mean? Well, in technical terms it means that the airflow passing through the diffuser no longer closely follows the diffuser's profile. Instead, at a certain point - determined by air pressure levels close to the diffuser wall - the airflow detaches and proceeds on its own horizontal trajectory. In practical terms, it means that this airflow is no longer generating additional downforce via the diffuser. This could be seen as a malfunction of the diffuser - which indeed it is - but it also an effect that can be generated intentionally. Among the potential benefits is an increase in straight-line speed thanks to the loss of drag, or an improvement in the car's overall balance thanks to the reduced rear downforce. Some teams mount their floor with a thin metal struts or cables. However, these solutions are just as prone to flex at speed, as the support Ferrari or BMW use could bend under the pressure of air passing under the car. So, some teams - media attention has focussed on Ferrari and BMW Sauber - utilize sprung supporting devices, which allow limited - but legal - movement of the front of the floor, to prevent damage over kerbs etc. The question being asked in Melbourne was: could a similar device be designed so as to allow much greater - and hence not in the spirit of the rules - movement under the greater loads generated at high speeds? Of course, the simple answer is, in theory, yes. By correctly engineering the 'set-up' of the spring - related specifically to its fixed rate and preload - it would be possible to control the flexibility of the bib (the section of the floor under the splitter) so as to pass the FIA deflection test but still allow greater movement under higher loads. In reality, however, there is no evidence of any team employing this theory and all cars passed scrutineering in Melbourne. "The various teams' methods of mounting the floor have been known to the FIA scrutineers for some time. The Ferrari and BMW floor, has passed scrutineering in every race it was used so far, at least since the Japanese Grand Prix last year (2006)." The speculation over movable floors is unlikely to continue much longer thanks to a small clarification to the rules introduced by the FIA ahead of next weekend's Malaysian Grand Prix. From then on, the floor deflection test will be carried out with any such supporting devices removed. On a side note, it was Coughlans assertion that the Ferrari splitter of 2007 was also being sprung to create a mass damper effect, with mass dampers being banned the previous year. Quote from Racecar-engineering.com “One of the defences used by McLaren (after Stepney-gate) was that Stepney, the former Ferrari employee, was ‘whistle blowing’ – something the court struggled to accept covered the whole affair, but it did certainly have an effect at the Australian Grand Prix. Ferrari won the race, but the FIA later outlawed the car’s floor. McLaren contended that the Ferrari that won was illegal, and a letter from Stepney to the FIA sent after the hearing revealed that it may well have been, as it was in effect a mass damper. Such devices were banned last season as they were controversially deemed to be a moveable aerodynamic device. Stepney reveals in detail the exact workings of the floor that was used at the race: ‘The front floor is attached to the chassis via a mechanical hinge system at its most rearward point. The most forward support is a body with one compression spring and one tension spring inside which can be adjusted according to the amount of mass that is fitted to the front floor. There is also a skirt that seals the floor to the chassis, which is made out of rubber and Kevlar to help flexibility and reduce friction in the system. The system detailed by Stepney allowed the F2007 to ride kerbs harder due to the 14-15mm deflection at the leading edge of the floor, which means the Ferraris could straight line chicanes more than other chassis. Front plank wear would also be reduced, allowing the car to run lower at the front, giving an aerodynamic gain. 3.12.6 To help overcome any possible manufacturing problems, and not to permit any design which may contravene any part of these regulations, dimensional tolerances are permitted on bodywork situated between a point lying 330mm behind the front wheel centre line and the rear wheel centre line. A vertical tolerance of +/- 3mm is permissible across the surfaces lying on the reference and step planes and a horizontal tolerance of 3mm is permitted when assessing whether a surface is visible from beneath the car. So now teams cannot purposely curve the flat floor for aerodynamic advantage.